Did you know that only 22% of people are price sensitive? That means that 78% of people don’t use price as their main motivator for purchasing. 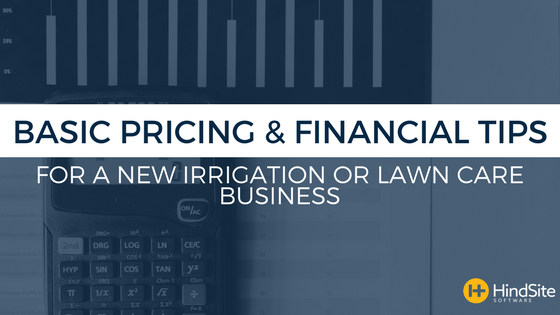 Your irrigation or lawn maintenance business has the opportunity to prove your worth through your work - which is the way it should be anyways. Even with that in mind, pricing is still a difficult thing to master. You don’t want to price too high so that you scare customers away but you also don’t want to price too low so that you are not making a profit. It can be even more difficult if you are just starting out and don’t really have an idea where to start when it comes to pricing. 1) Know what direct costs to your work are. Things like your labor or materials are direct costs - whatever goes directly into the job, ensuring its completion. 2) Know your overhead costs. These would be things like paying rent or a mortgage on the building your office is located in. It can also be things like paying for the phone or internet bill. These are not things that go directly into the work for the customer, but they are things that are necessary for the job to get done one way or another. 3) Calculate the profit you want to make. Once you have calculated how much the job will cost, you need to add in some sort of a profit. Otherwise you will never grow. This all depends on what you as a business owner wants to charge. And this may change from one project to another. You can charge different customers and projects different amounts - just be sure you are charging enough to make an actual profit. Getting your pricing down takes some time, a bit of calculating, and a lot of patience. You may not get it right the first time around, but by knowing your costs, you can start to gain an idea of what prices you will need to be charging to grow as a business. Customers will say yes to your price if they feel they are getting their money’s worth in work. While a “No” can hurt, try not to take them too personally. Some people are never going to be willing to budge and instead of wasting time on them, turn your focus towards the other 78% that are not price sensitive. Do not try marketing towards those who are focused solely on price because it’ll probably end up not being worth your time or money. The companies that charge less, also owe customers less in terms of work because they are not making a large profit on the job. You can beat competitors by proving your worth to customers. For some firing a customer may sound like a ridiculous idea but - from time to time - it’s totally okay to do. We all know the tried and true statement “the customer is always right,” but sometimes the customer turns out not to be right for your company. The cost of the customer is not always worth the profit your company makes from them. If this is true, it is better to cut them loose and focus your efforts on more profitable customers. Sometimes these decisions improve the mental health of the company. If you do decide to keep the customer, make the cost worth the pain. If they are taking an extra toll on your patience and psyche, then you can charge them more. It doesn’t have to be a significant amount either, just enough to make the job and annoyances worth it. Whatever you decide to do, make sure the customer is worth the effort and price. This can be a hard decision because no one likes to lose the revenue, but it can also be in the best interest of the company. 1) Live on your worst year: In today’s world, this isn’t all that hard. From time to time we all are faced with tough economic situations and have to cut back. This is a lot easier to do if the way you spend money and operate your business is based off of your worst year. 2) Collection: Collect your payments as fast as possible. Collect on delivery, or COD, is a great policy to have for your company. Once a service is ‘delivered’ have your customers pay you. This way there is no waiting period for your company to receive the money they already did the work for. If you have a policy where you ask for payment on delivery, make that clear to your customer when they call. This way, they know in advance you will be expecting payment the day of service. 3) Develop a maintenance agreement: This is for the irrigation businesses. If most of your customers require work on a regular basis then it might be a good idea to create monthly service or maintenance contracts. The money will be regularly withdrawn from the customer’s account so you know exactly when you will be paid. Bonus Tip: Put one percent of every dollar you collect in a savings account. You’d be surprised how much this can add up to be at the end of the year and it is always a good idea to have extra money saved up in case of emergencies.